Lagos, Nigeria (CNN) Henry Obiefule has been making others laugh with his internet skits, but now he’ll be laughing all the way to the bank after signing a million dollar deal. 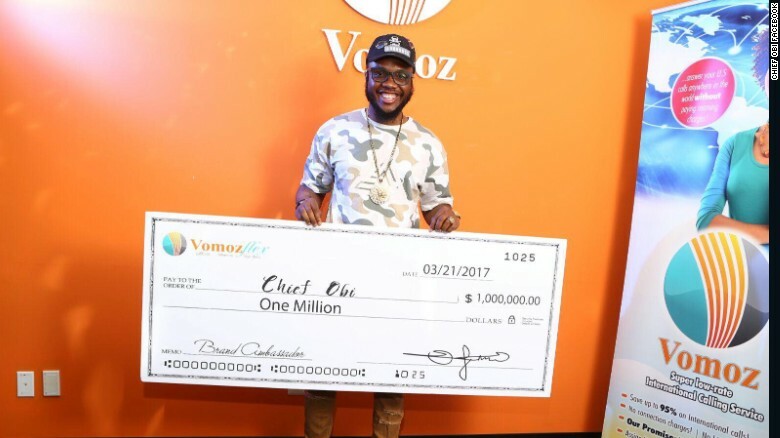 “I have been endorsed as the first ever Vomoz Communications Brand Ambassador,” the Nigerian comedian announced on his personal social media account, Wednesday. Obiefule commonly known as Chief Obi, is popular for his comical portrayal of a stereotypical Nigerian dad. Obiefule start making videos on the platform ‘Keek’ in 2012. “My first video was just a regular goofy video,” he told CNN. “People liked it and demanded I did more so I continued. From ‘Keek’ we moved to ‘Vine’, from ‘Vine’ to ‘Instagram’. He now has more than two hundred thousand followers and has featured in videos of prominent artists like 2Face, Olamide and Jidenna. Obiefule is not the first Nigerian internet sensation to get a big break with funny skits. Multiple award winning child comedienne, Emmaneulla Samuel gained global traction with her hilarious short videos.